Liaison Office director Wang Zhimin yesterday accused some locals of "colluding with anti-Chinese politicians" and posing threats to national security even as some countries are employing tactics to try to contain China. 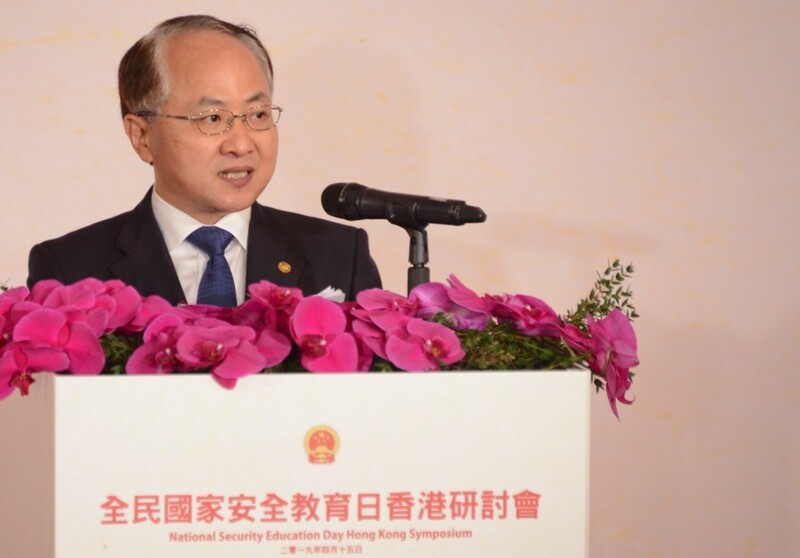 Wang's remarks came in a speech at the National Security Education Day Hong Kong Symposium attended by representatives of the SAR administration, the Liaison Office and the Hong Kong and Macau Affairs Office. Wang said Beijing is coping with the most complex and capricious security environment since the end of the Cold War, and some countries are desperately trying to contain China by playing the "Hong Kong card." He added: "A handful of individuals in Hong Kong are busy colluding with anti-China politicians and organizations by taking part in closed-door meetings and seminars in an attempt to badmouth Hong Kong and beg for foreign intervention. "These few individuals, who are paid generously with taxpayers' money, have made repeated overseas pilgrimages to sell out Hong Kong for personal gain." And they were set to be despised by the people of Hong Kong and the entire nation, he declared. But Wang did not go on to name anybody. It was noted, however, that former chief secretary Anson Chan Fang On-sang and legislators Dennis Kwok Wing-hang and Charles Mok went to the United States in March and met American politicians - including Vice President Mike Pence - to express their concerns over the implementation of the one country, two systems arrangement. Wang then moved on to identify the Occupy movement as having been a serious threat to national security. He said: "Many of my friends kept asking these questions: Why did some professors and scholars brazenly instigate this illegal campaign of Occupy Central that endangers national security? Why should the general public pay for the damages they inflicted?" He also said the Occupy movement pointed to a legal loophole in Hong Kong's legal system when it came to safeguarding national security. "There is only the responsibility of one country in terms of national security," Wang remarked, "and there is no difference between the two systems." He said the fact that all nine defendants in the Occupy public nuisance cases were found guilty on April 9 made that day an important one in the manifestation of the rule of law in Hong Kong. The deputy director of the Hong Kong and Macau Affairs Office, Deng Zhonghua, who arrived from Beijing for the event, said there were incidents in Hong Kong impacting the bottom line of national security and they should be handled with zero tolerance. "This is the most important item in implementing the one country principle in Hong Kong and also the duty and responsibility of the SAR government and Hong Kong citizens," Deng said. "Relevant laws should be improved, and any behavior threatening national sovereignty and security should be prevented and punished." Civic Party leader Alvin Yeung Ngok-kiu said he was not going to speculate on who Wang was referring to as "colluding" with foreign countries, but he believed pan-democrats had been presenting the true state of affairs in Hong Kong to the world at large. "We also lobby for the benefits of Hong Kong when necessary - for example we went to the United States to persuade them not to include Hong Kong in the Sino-US trade war," he added. The convener of the Independent Commentators Association, Bruce Lui Ping-kuen, said Wang was pressing for enactment of the Basic Law Article 23 to ensure local legislation for a national security law when he talked about a legal loophole. And the convener of the Professional Lawyers Group, Billy Li On-yin, said it was inappropriate for Wang to make remarks about the Occupy case as a court had yet to sentence the nine defendants - and they could appeal against the convictions. Wang "might not be trying to address the court," he added, "but people may speculate about the judge listening to him and sentencing the nine to long prison terms, [which] would reduce people's confidence in the courts and judicial independence."